Our farm was established around 1840, and the holding has changed little since then, apart from some modernisation in the 1950’s. The land was once bog, but has been improved over the years – the original buildings are still in use, and the property had been passed on through inheritance until the elderly owners sold it to us in May 2012. Cottages like this one are commonplace across Northern Ireland, but vanishing rapidly, as they are torn down to make way for more modern buildings. We decided from the outset to retain ours, not only because we like old cottages but because it is a great example of low impact building. The walls are made from stone that was most likely cleared from the spot where it stands. 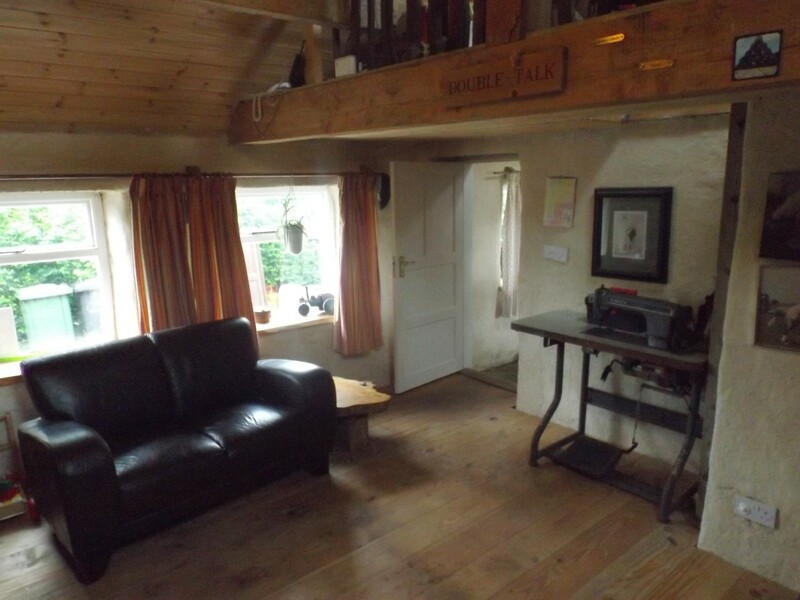 The original roof timbers are debarked larch trees – which still grow around the cottage. 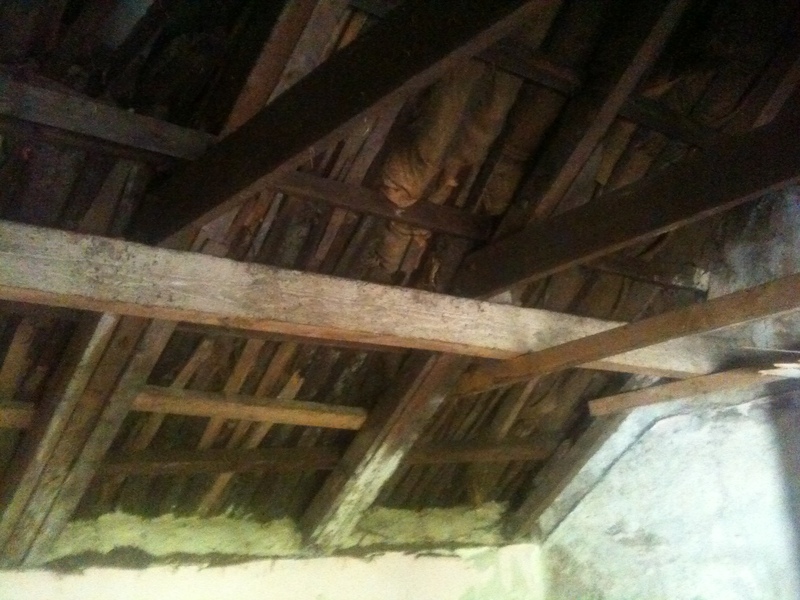 Although now gone, the roof was made from split larch spars and reed thatch, cut on site. Although reusing an existing building might not result in as energy efficient home as a new build, a lot of energy and resources are saved by making good use of what is there. Reusing old buildings is less common in Northern Ireland than other parts of the UK, but we were keen to retain the cottages and retain their original character. We were concerned to use materials that were natural, low in chemicals, and which worked sympathetically with the stone structures whilst providing an energy efficient home. 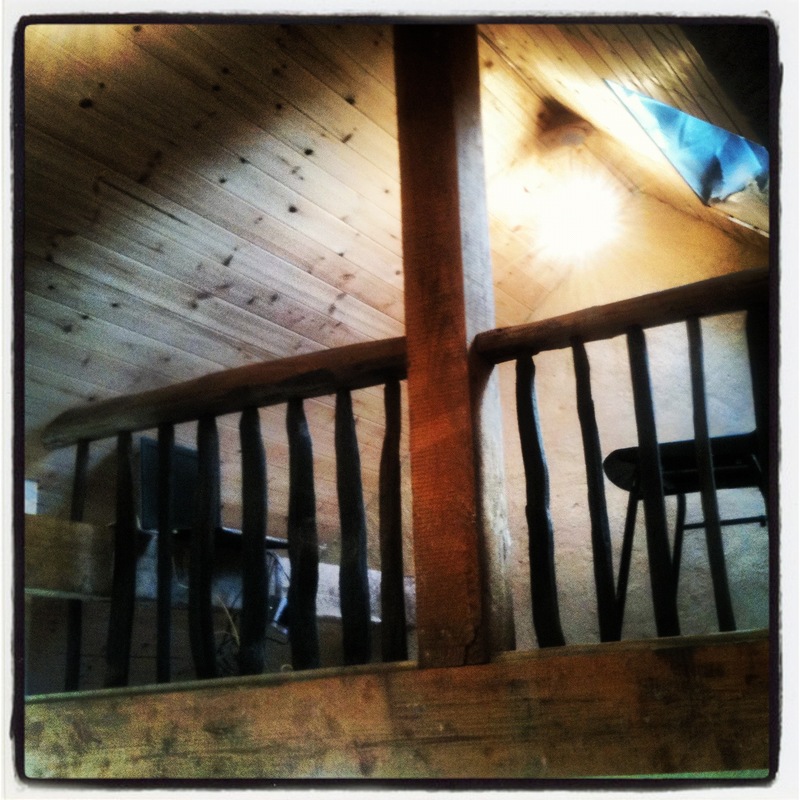 Materials such as sheep’s wool insulation, lime-hemp plasters and locally sourced timber have enabled us to achieve this. As with many properties of this type, the walls had been dry lined, which only served to hide fairly horrendous dry rot in the still, damp air behind the board. Removing it, and the thick, impervious concrete render was the only way to cure the problem. The kitchen on arrival. Concrete render, a false ceiling concealing and containing the remains of the thatch. Renovation entailed removing a lot of old concrete render from the walls and floor, all of which was then reused on site in paths. 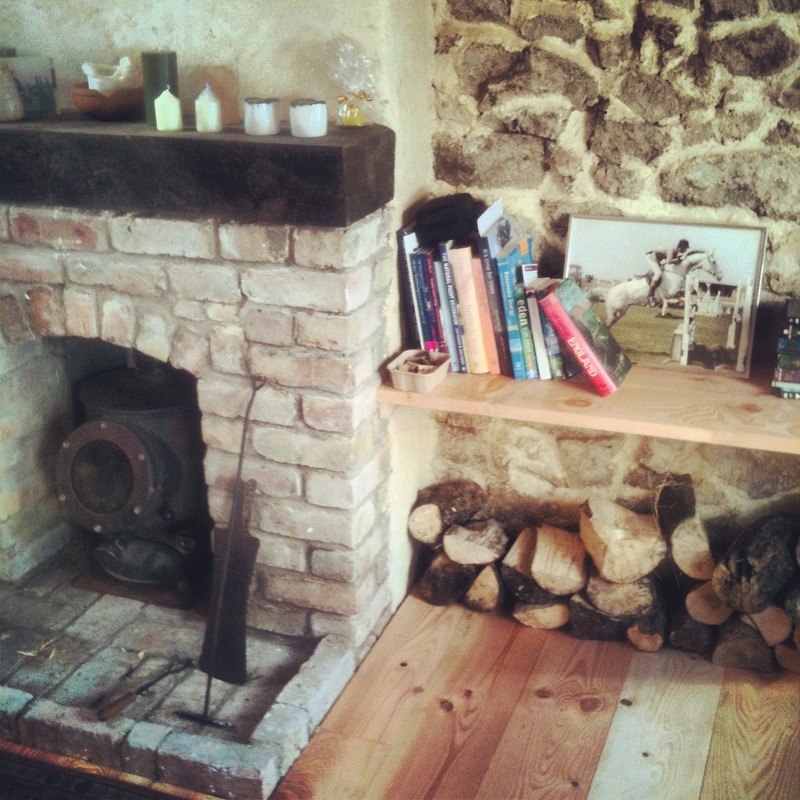 Old timbers were used as fuel, and a ceiling became our kitchen. Old copper plumbing pipe has found a new home as curtain poles. In the end, the only waste that we couldn’t reuse, compost, or recycle turned out to be old plasterboard, and lino flooring. Everything else is still here somewhere. Because the structure is stone, and has no damp proof course, it is essential that it is allowed to breathe, so that moisture can escape. The rising damp that was present throughout was caused by high ground levels outside, and concrete render inside, which held water in the walls, causing the problem. The solution? Lower the ground level, and use lime based plaster inside, which has dried the walls out almost entirely. 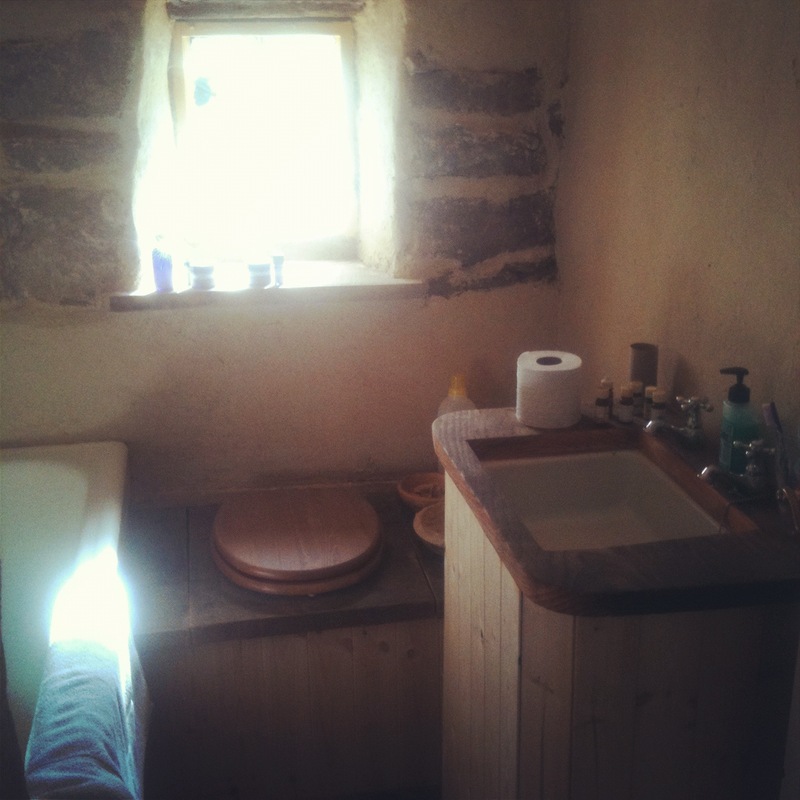 A major decision we made was that we would avoid chemicals in the build wherever possible, so lime plaster instead of gypsum, sheeps wool insulation in the roof, locally sourced wooden flooring, treated only with linseed oil, and water based paints. 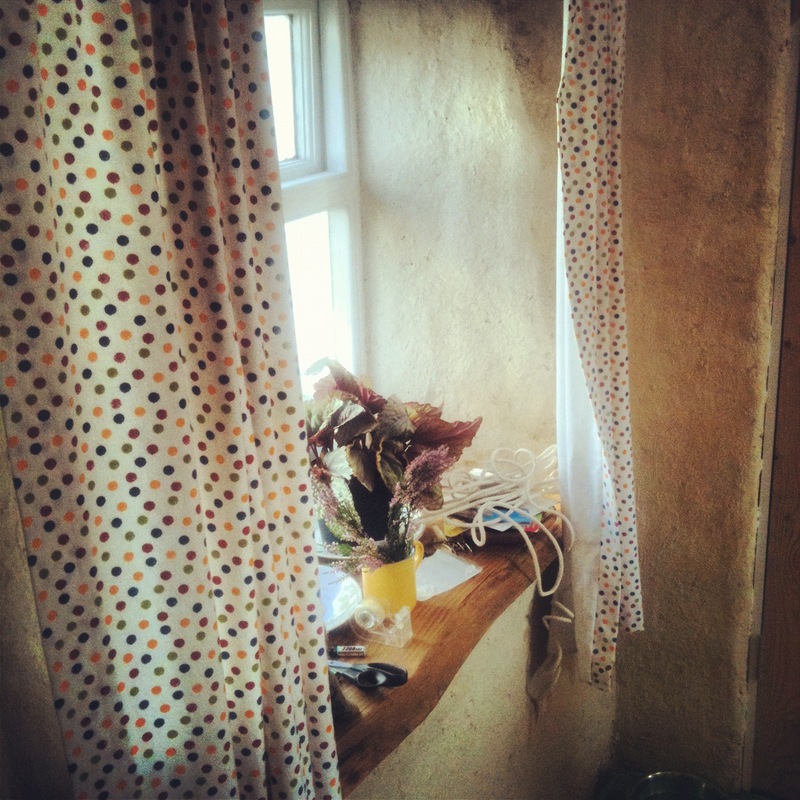 Local douglas fir windowsills, copper pipe curtain poles and home made curtains. Everything that could be found second hand, was. Gumtree is a particularly good source of pre-loved items, and baths, radiators, sinks, wall and floor tiles were all found either through it or on freecycle. 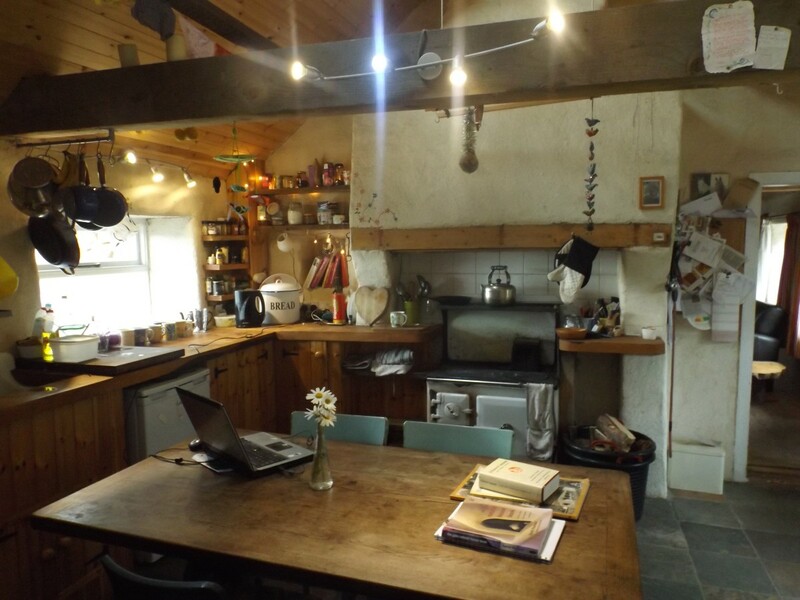 Doors were recycled, the kitchen is made from an old pine ceiling, and shelves, window sills and worktops were all bought as unfinished timber direct from the sawmill. Although much of the old timber was infested with beetle or rot, we salvaged what we could, and it lives on in things such as banister rails in the living room platform. 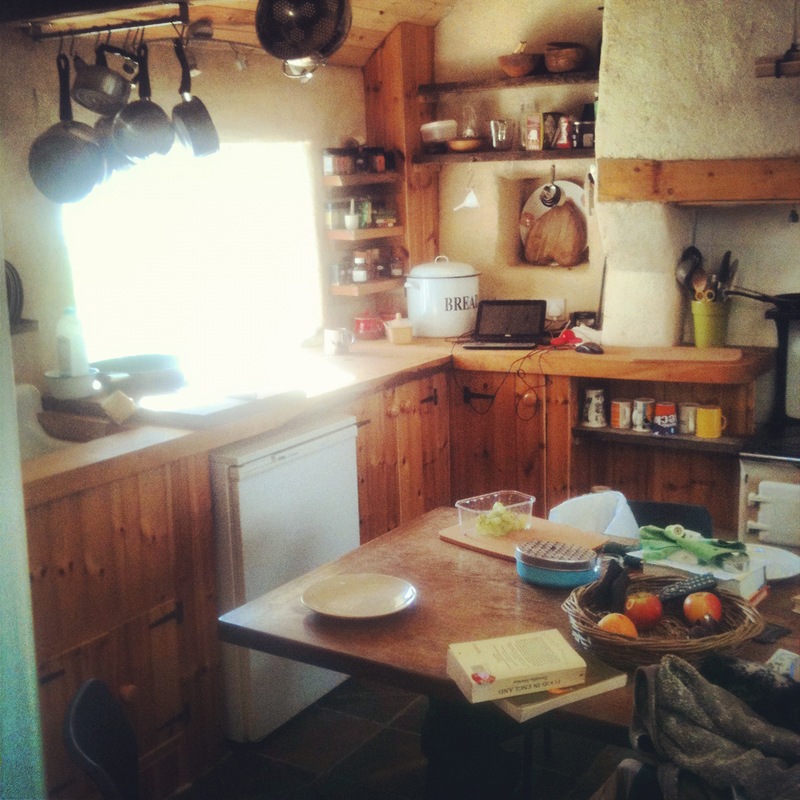 We’ve kept the original range cooker, and the new kitchen is made from what used to be a ceiling. It was particularly satisfying that Grace, who spent many of her younger years in the cottage, was able to give the finished work her blessing, and was glad to see it have a new lease of life. We were fortunate that following an article in our local paper, people came forward and told us their stories, and offered lots of fascinating information about the history of our lovely little house. Where practical, we have used recycled materials – flooring, sinks, bath, kitchen – often older items are made to a quality that is hard to find in modern counterparts and which can offer many more years of useful service. 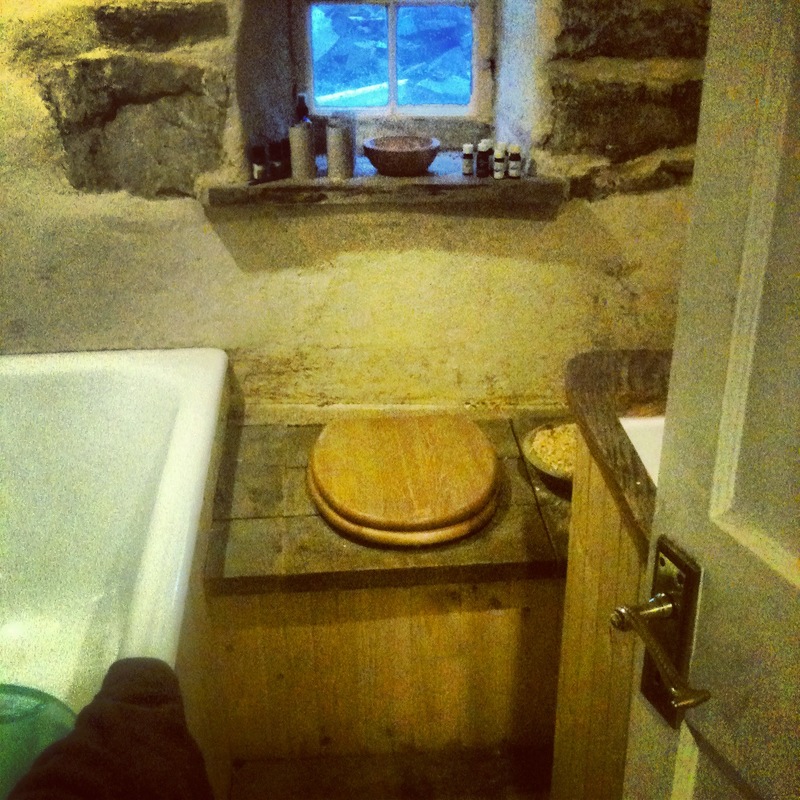 The bathroom – recycled bath and sink; second hand floor, composting toilet made from old roof timbers.